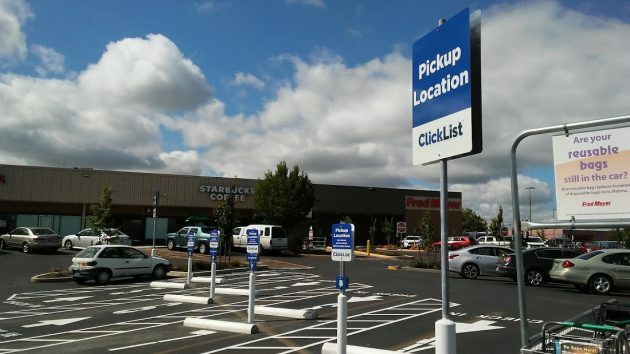 Parking spaces for new “ClickList” program have been painted at the Albany Fred Meyer store. Change and innovation are about to hit the Albany grocery-buying scene in a couple of different ways: the opening of a huge new supermarket and the start of parking lot service at a long-established one. The Albany Fred Meyer plans to start offering what it calls “ClickList” — not to be confused with “chick lit” — starting in about a week, as I understand it from an employee at the store. This will allow customers to order groceries online, pick a preferred pickup time the next day, drive to the store at the appointed hour and have someone put your order in the car. You never have to get out in the rain or unstrap the kid from the car seat. There are some limitations to the program. You can pay only with a credit or debit card, no cash. And only groceries and personal items can be purchasd that way. For the details check Fred Meyer’s ClickList website. The service has been available in the Portland area since last summer or fall, but its new to the mid-valley. The other big change is the impending opening of the 85,000-square-foot Winco supermarket at 3100 Pacific Blvd. S.E., the site where Kmart was demolished. July 6 is the date the store will be open for business. 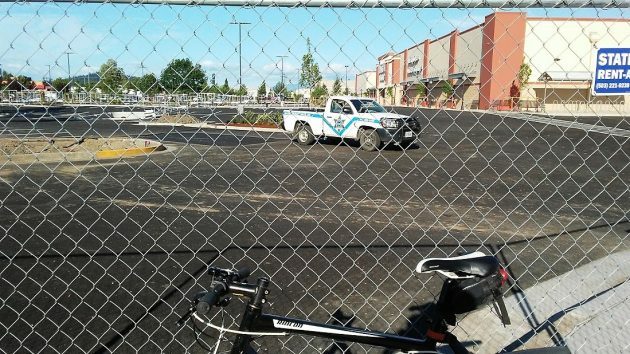 Fencing still blocks the public entrances to the rebuilt parking lot, but trailers are backed up to the loading dock, and workers in red Winco T-shirts have been going in and out of the new building. A security guard patrols the Winco parking lot on Tuesday evening. The new Albany Winco from another angle. Fast forwarding to the grocer wars as Amazon enters the fray. Should be fun to experience! Now I wonder if it is safe to consult the google machine about “chick lit”. Still thinking this one through “Herald Godson”. Ha! I’m excited for the coming grocery stuff. This Fred Meyer thing is only a tiny first step. It’ll be just a few short years until we get robot deliveries to our homes. This is going to advance quickly.